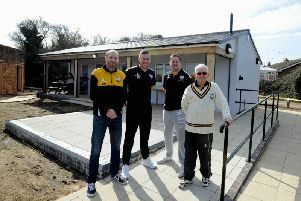 On bank holiday Monday, Horsham Park Bowls Club held a party to celebrate the anniversary of 50 years of playing bowls in the park. Many ex-members were invited to join in the fun and renew friendships made over the years. Club members were asked to wear something colourful rather than club uniforms to enhance the party mood. The afternoon started with a spider where all bowlers positioned themselves around the edge of the green and on the sounding of a bell everyone bowled at the jack in the centre of the green. The spider, which cost a pound to enter, was in aid of Visually Impaired Bowls England. The winner was Martin Bryant who got his bowl nearest the jack. With so many bowls aimed at the same time, it was inevitable that many on target bowls were knocked off course. This was followed by a number of teams playing different variations of bowls, the most difficult of which was to bowl with no jack, the skips then took it in turns to put the jack up, hopefully into the middle of their own bowls. This proved to be very tactical as players tried to cover off the oppositions bowls, this was more difficult than it sounds. There was then a superb celebration tea with anniversary cakes plus many glasses of bubbly. Everyone voted the afternoon a great success, roll on the next 50 years. Bowls is a game that can be enjoyed by people of all ages. Anyone interested in taking up bowls in the park, please contact David Peters on 01403 266170. All equipment plus coaching available.